Discussion in 'Digital Photography' started by acearchie, Jun 17, 2012. Recently bought a new zoom lens (17-55mm f2.8 Canon) and the barrel physically extends at the end. Because it was second hand and therefore has been used before and the joys of gravity it is exhibiting the signs of zoom creep. I have read online that putting some tape on the barrel will just add a sufficient amount of thickness so that it doesn't creep on it's own. Has anyone tried this with their lenses and does anyone have any other tips or suggestions? It works , or at least it did 20 years or so when I used it on a couple of manual focus Nikon zooms . If I remember right I put several strips of black electrical tape running longways on the barrel , spacing the strips equidistant around the barrel . Seemed to work pretty well . 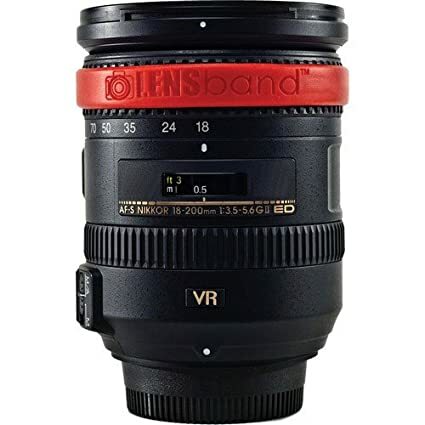 There's a thing called a lens band which is basically a rubber band that you put around your zoom ring and twist into an angle to lock the zoom in place. I've only seen these online so can't attest to their effectiveness but one could be the solution you are looking for. I think this is the way I will go. I had read the same thing with normal Sellotape and then with masking tape but as long as the electrical tape doesn't leave residue this seems like the best option as a low key diy fix! I've seen them and whilst they're not pricey they are a bit of a hassle. I think the tape route means that they would only need to be refitted every so often, not every time I take a picture. The other thing is that the lesnband is really for when taking pictures and the main issue I have is when I am just walking with my camera. I do the same thing but the issue is when it's hanging off my shoulder, the extension makes it just that much longer to bash into various objects! in that case... tried the RS-5? My 24-105 creeped when I had the hood on. Unfortunately I never found a cure. Luckily it didn't bother me much. You like the 17-55? Mine practically lives on my 7D. Because it was second hand and therefore has been used before and the joys of gravity it is exhibiting the signs of zoom creep. It probably did it when new my one did. It's not really a problem you just get used to it. I personally wouldn't go stick tape on it. EDIT- Just reviewed it, and I guess it will depend on the construction of the lens. I seen another member mention the Lens Band and I just had to chime in. I am currently using the Lens Band and I think it's the best thing since sliced bread. I purchased it from Amazon and got it in 2 days with free shipping. Here are some photos using the lens band on my Canon 70d and 24-105mm. I no longer have "zoom creep"
Affiliate link! Be wary as it looks like the poster is only trying to benefit themselves! Oh come on, as if somebody with a new account and only a single post would ever do anything like that. He just 'had to' chime in!